Metfold Matt Dust Jacket Sleeving is used in Libraries, bookshops and by private collectors. Metfold Clear Dust Jacket Book Cover Sleeving is used in Libraries, bookshops and by private collectors.High Quality U.V. resistant film and Brown paper Backing which form a removable sleeve around the dust jacket. Australian Made. Not only does Metfold protect your valuable books while enhancing their appearance, it can also be removed from the book without any evidence that it had ever been used, preserving the value of the book. All rolls are 50 Metre in length. 200mm Matt Book Jacket Covering Material-50 Metre roll. High Quality U.V. resistant film and Brown paper Backing which form a removable sleeve around the dust jacket. Australian Made. Suits books up to 200mm in height. 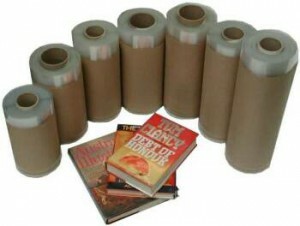 230mm Matt Book Jacket Covering Material-50 Metre roll. High Quality U.V. resistant film and Brown paper Backing which form a removable sleeve around the dust jacket. Australian Made. Suits books up to 230mm in height. 250mm Matt Book Jacket Covering Material-50 Metre roll. High Quality U.V. resistant film and Brown paper Backing which form a removable sleeve around the dust jacket. Australian Made. Suits books up to 250mm in height. 270mm Matt Book Jacket Covering Material-50 Metre roll. High Quality U.V. resistant film and Brown paper Backing which form a removable sleeve around the dust jacket. Australian Made. Suits books up to 270mm in height. 300mm Matt Book Jacket Covering Material-50 Metre roll. High Quality U.V. resistant film and Brown paper Backing which form a removable sleeve around the dust jacket. Australian Made. Suits books up to 300mm in height. 330mm Matt Book Jacket Covering Material-50 Metre roll. High Quality U.V. resistant film and Brown paper Backing which form a removable sleeve around the dust jacket. Australian Made. Suits books up to 330mm in height. 380mm Matt Book Jacket Covering Material-50 Metre roll. High Quality U.V. resistant film and Brown paper Backing which form a removable sleeve around the dust jacket. Australian Made. Suits books up to 380mm in height. 420mm Matt Book Jacket Covering Material-50 Metre roll. High Quality U.V. resistant film and Brown paper Backing which form a removable sleeve around the dust jacket. Australian Made. Suits books up to 420mm in height.